You can attain great kayaking experience with your partner or by yourself when you have the best kayaking equipment. This includes not only the best kayak you can find but also the best kayak paddle to match not only the kayak, but also you. Choosing the best kayak paddle is not easy as it seems. This article shows some of the best paddles you can ever find and answers most of your curiosity regarding how to choose one. The length of the paddle will determine the kayak’s speed and control. Perhaps, the length is the most important factor in selecting a paddle as it takes into account the boat width, your overall height, and your paddling style. Kayak paddles typically range from 210-260 cm. In general, the wider the boat, the longer the paddle needed. This is because there’s a flatter angle between the paddle and the water when in wider boats. The height of the person also plays a vital role in sizing to ensure a comfortable navigation. This stroke is commonly used in recreational kayaking because it conserves more energy than the high-angle paddling. Thus, it's an effective style for longer trips. The blade of the paddle has a flatter angle resulting to slimmer blades. It's also slightly longer than high-angle kayak paddles. This stroke is more intense and more aggressive; apt for kayaking in fast moving water surfaces. This stroke provides great acceleration and maneuverability. The best kayak paddle offers a balance between lightness and strength. 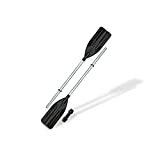 The lightness is for easy paddling and the strength is for endurance in long trips or when doing the high-angle paddling. Materials like fiberglass, carbon fiber, nylon, and aluminum are some of the best choices for the blade. They differ in prices, strength, and durability. Feathering is about the angle of the blades at both ends. If they are in the same line, the paddle is identified to be non-feathered. Otherwise, it is feathered. The feathering of the paddle aims to reduce wind resistance and wrist fatigue. The science behind is when the other blade strokes through water, the other end slices through the air. One hand would always be in control of the paddle with each stroke at a most effective angle. Asymmetric blades are more common these days as they tolerate more horizontal strokes and would be less tiring on your part. Symmetric blades, on the other hand, are good for high-angle paddling. A dihedral-shaped blade aids the water to flow smoothly and evenly. The flat blade also has the same applications as the dihedral blades, but they aren't as popular as them. Most paddles have straight shafts, but some prefer curved shafts so that there's a more forgiving angle at each stroke. Shafts can also be oval or round. Oval shafts offer better grip than the round shafts. There are also some shafts that can be broken down into two or four pieces for easy storage in the kayak. Carlisle Magic Plus is one of the best kayak paddles I’d recommend for its lightness and durability. Unlike most paddles that are made of aluminum, this one uses pure fiberglass for a more flexible navigation. This is also a popular choice among the kayakers because it’s available in vibrant colors. Using this paddle makes it easily visible in the water. The blades of Magic Plus are composed of fiberglass-filled polypropylene blades. The blades are slightly spoon-shaped to facilitate powerful strokes and added leverage in the water. The blades can be feathered through the center button at the shaft where it allows up to 60° angling. The Magic Plus offers a great balance between strength and flexibility, and it's largely thanks to the unique fiberglass shaft. The fiberglass is both durable and lightweight in which it reduces the fatigue felt by the paddler because of continuous paddling. The shaft also has the ability to absorb impact. The shaft has a push-button breakdown for easy storage. The paddle comes with a rubber drop rings which are supposed to keep you dry when paddling. However, they can get flimsy and allow water to leak through. Carlisle Magic Plus Kayak Paddle is available in three colors: Sunrise (orange/yellow), Cloud (blue/white), and Dark Cherry. Furthermore, it’s available in three different lengths: 220 cm, 230 cm, and 240 cm. This is the kayak paddle if you're on a tight budget. In fact, it's not only for kayaking but can also be a replacement in maneuvering a boat as oars. This paddle can split into two as makeshift oars. This is a cheaper choice as a replacement paddle or as a backup. Overall, this kayak paddle measures 240 cm when you use it for kayaking. It can be halved, and both oars measure 120 cm. The shaft is made of high-quality aluminum and has a diameter of 1 inch. When converted back into a paddle, both ends are joined at the center by a plastic coupler. A plastic coupler joins the paddle. Given the price, it's unlike other paddles that use metal coupling at the center. Because the plastic coupler cannot compare to a metal coupler in regards to durability, you should practice carefulness when tightening the nuts. Another thing I observed is the heaviness of this kayak paddle. It weighs 3.5 lbs. and can be a bit strenuous to the muscles in the long run. The blades are made of hard plastic that are quite big. They have a subtle curve to facilitate easy paddling in the water. The blades can be feathered through the coupler at the center of the aluminum shaft. This kayak paddle has drip rings to retain water from leaking through the kayak. And lastly, it’s only available in black color. The X-Treme II is one of the most popular kayak paddles because of its versatility. It can cater a wide range of customers though it’s only sold in two lengths: the 210 cm and 240 cm. The secret lies at the three locking positions where they can be adjusted depending on the paddler’s height. Because of this, your kid can also participate in maneuvering the boat. The shaft of X-Treme II is made from high-quality aluminum. The shaft has support ridge for additional strength. It’s also considerably thin which makes it applicable to use for everyone. The shaft has two rubber foam grips for added comfort. When not in use, you can detach the paddle into two pieces for easy storage. The blades of X-Treme II are made out of hard, molded plastic. They can be feathered if you’d like. The paddle has drip guards to shield you from the water that may leak through because of continuous paddling. As the paddle is lightweight and the blades are rather thin, it’s a great option when it’s for recreational kayaking. However, this paddle may not be suitable if you’re kayaking in aggressive waters. Another thing is the moving of the foam grips when they’re wet but won’t adjust when they’re dry. The X-Treme II is available in other vibrant colors aside from black. It is fairly easy to spot in the water because of its color. The SeaSense X-1 is a cheaper alternative to the SeaSense X-Treme II. 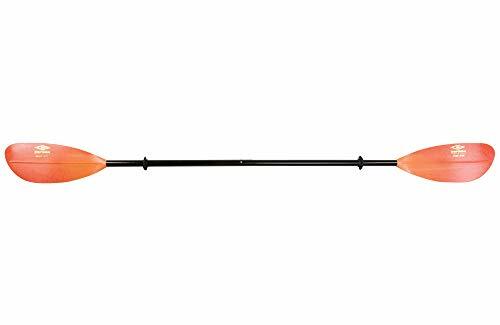 This X-1 kayak paddle is available in only one length (210 cm) and a good choice if you’re looking for a paddle at a low price. This kayak can be a great replacement or can also be a backup paddle. It’s a great entry-level kayak paddle because it is both lightweight and balanced. It can be adjusted to three different positions to suit your desired length and style. The X-1 features two contoured plastic blades. The blades are rather in a unique shape which sets it differently than most kayak paddles. The shaft is made of lightweight aluminum and can be split into two for easy storage. There are two foam grips fitted into the shaft’s diameter for a more comfortable cruising. The paddle has two adjustable rubber grips to help prevent the water from dripping into the kayak. They are intelligently designed to keep you dry. As observed, the square-shaped blades can be very unstable in the water and could be difficult to use at first. The blades also retain water which causes splashing into the kayak. Another disadvantage is the sliding up and down of the foam grips when they're wet. Shoreline Marine Kayak Paddle is another entry-level paddle for beginners. It’s relatively the same as the X-Treme II and X-1 of SeaSense with only a few differences. It’s an affordable paddle not only for beginners but also those who are skilled. The main key point of Marine is its lightness. It allows the paddler to cruise with ease and have lesser fatigue at the joints. The blades cut through the water quickly as they contour molded. They push great amounts of water at each stroke, and so, the kayak can sail at higher speeds. Its shaft is made of aluminum with foam grips and drip guards. The shaft is lightweight and is great for long or short trips. It can be disassembled into two pieces when not in use. Moreover, this paddle can be customized to any style and length through the three position system. This paddle is only for light duty or recreational kayaking. I don’t recommend you use this in moving water as the blades are rather thin. They can break if you push them too hard. Also, the drip guards seem to turn upside down when wet. This can cause annoyance for some. This paddle is only available in its 240-cm length model. The best kayak paddle can fully serve its purpose whether you're kayaking in calm or moving water bodies. The paddle that you buy should considerably match your kayak. You now know what features make a great kayak paddle from the above guidelines.